Greenleaf State Park is a small enclave of adventure tucked into the woods of northeastern Oklahoma. Sixteen cabins—including one that’s ADA certified—let visitors wake up to sunrise on Greenleaf’s 930-acre lake. 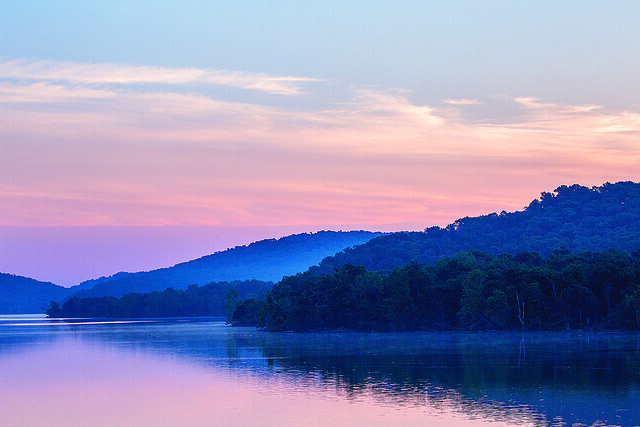 In an age when screens dominate just about every aspect of life, Greenleaf State Park outside Braggs offers a refuge where it’s possible to shut out the digital distractions and experience the subtle splendor of nature. Families can play miniature golf, volleyball, basketball, or baseball; swim in the pool; or fish in the children’s pond, from the heated indoor dock, or on a rented paddleboat or canoe. Eighteen miles of trails allow visitors to wander through sun-dappled tree groves, take photos crossing the swinging rope bridge, or interact with some local wildlife. After working at Greenleaf for about two years, assistant park manager Joseph Hahn has seen wintering eagles, raccoons, hogs, and all manner of songbirds, but some wild encounters stand out in his memory. It’s the quiet moments, free of the beeps and the rushing and the glare of modernity, that make Greenleaf State Park a place where both man and beast can find peace, if only for a little while. Greenleaf State Park, 12022 Greenleaf Road in Braggs, (918) 487-5196 or TravelOK.com/state-parks.